Because vacation is a subject everyone likes. With around 10,000 partners, we are the biggest and most successful provider of travel partner programs. Our concept is designed to be win-win. It doesn’t matter WHEN you jump in, and you don’t have to make any significant investments, either. You can also take a couple weeks, months, or years to think it over. But then you’ll miss out on the steady revenue that would have been easy to generate in that time. With more than 120 service providers — such as travel businesses and portals, airlines, ocean carriers, hotel chains, hotel and rental car portals, vacation home hosts, and travel insurance companies — we cover the entire spectrum of the travel market. As a result, we offer considerably more than most normal travel bureaus in the program. We’ve already marketed all these offers online with virtual travel shops and booking machines. They can be booked 24 hours a day, with several hundreds of millions of travel offers to choose from and a price comparison feature. The whole thing is subsidized by about 500 advertising tools such as travel search boxes, banners, and templates. We receive hundreds of requests, calls, and bookings daily. For every trip placed, we get a commission from the tour operator. If the booking comes through a partner site, we pass a majority of the commission on to that partner. We call this an advertising subsidy. This amount is attributed and paid out to the account of the respective partner. On a steady basis, for every single booking. All you need is a website. You probably have one already. Incorporate our advertising media there, and your site visitors can start booking trips. We’ll take care of the offers in it, the booking, customer service, and billing. That means no work and no cost for you – except a monthly fee for the “Professional XL” and “XXL” partnership levels. The “friends & more” and “Professional L” partnership levels are free. A lucrative deal. So why are we sharing it with you? Naturally, companies like us can create our own professional websites and offer trips there. But we don’t reach nearly as many customers that way as we do with our current 10,000 partners. We want to keep expanding this business – and gain you as our partner. The customer can choose from the complete range of offers from over 120 renowned vendors, and find their dream vacation just as fast. This increases turnover, from which you and we both profit. Many trips are booked long in advance, up to ten or twelve months before the trip itself. In contrast to other partnership program vendors, we don’t wait to pay until after the customer starts their trip. With us, you receive your advertising subsidy transferred to your account no later than two weeks after booking. Even for bookings made through our call and service center, you get the full subsidy if the booking is made through your hotline number. You receive this at no cost in the Professional partnership levels. If the customer rebooks for a later date by calling us, you’ll also receive the full subsidy for this follow-up booking. As the marker leader among travel partner program vendors, we offer the perfect partnership for everyone. Start out free in the “friends & more” and “Professional L” partnership levels. If your sales figures reach over 65,000 Euros or 250,000 Euros in the year, you can switch to the “Professional XL and XXL” partnership levels. If you run a private homepage, our “friends & more” partnership level is the one for you. Simply install our advertising tool and you can book your own trips – with price advantage – immediately. Your page is also worth your friends’ and acquaintances’ while; this is where they can compare prices from all trip vendors and book package tours and last-minute trips with the Best Price Guarantee. Of course you’ll also receive the full advertising subsidy for these bookings, and you can share it with your friends if you want. If you’re a beginner, you also have the option of starting off in the free “Professional L” level. Professional website operators who already have experience in online marketing are offered a good and free way of getting started with the “Professional L” partnership level. You can switch to the “Professional XL” and “XXL” partnership levels when your turnover reaches the right amount. As a professional partner, you’ll get your own hotline number to publish on your website. It’s connected to our call and service center, which will take care of all handling and billing, as well as customer service. You can track all booking details in real time in your partner account. Our employees in the call and service center record all contact with the customer and every step of the procedure involved in a booking in a memo. You can view this at any time. You’ll also find a nuanced booking overview in your account. With this, you can find specific bookings quickly and easily, or generate an offline report as a PDF for your records or informative statistics. The booking overview also makes it easy for you to adjust the use of advertising media precisely in accordance with customer behavior. As our partner, you’ll get regular information from us about interesting travel destinations and products. You’ll also find a list of the current top sellers in the trend barometer in your partner account. This way you always know exactly what is popular and can adapt your website accordingly. Support that really helps -- and at no cost! Sign up now with no obligation! Travel vouchers for customers and employees. Additional benefits and bonuses in the consumer sector are an effective tool in competition for customer favor and loyalty. Everyone is happy when they’re given something, especially when it brings them something real, like significantly relieving the burden from their vacation savings. The same thing applies to employees. Their motivation and commitment will be effortlessly increased with interesting bonuses and rewarded, especially if they aren’t taxable and carry a real advantage. In both instances, clever strategists can now use travel vouchers from travianet that customers or employees can redeem with us or our partners. The travel voucher issuer: They can use the travel voucher as an attractive advertising tool with customers or for employee motivation. The customer or employee: They have a considerable price advantage in booking their vacation or trip. The travel voucher issuer (again): Their expenses (depending on the booking amount) are reduced, paid off, or even converted to profit through cashback. With our system, we generate vouchers for you with individual voucher numbers. The value of the voucher can be defined by you at the amount of your choosing, let’s say 100 Euros. The vouchers can be issued physically in printed format, or online at your website, a landing page, or in a newsletter. The recipient of the travel voucher can redeem it directly at travianet or with one of our partners when booking a trip there. The respective domains will be disclosed on the voucher or in context to it. The 100 Euros will be subtracted immediately from the booking invoice total and charged to the issuer as a debit at first. However, the issuer of the voucher will be paid out a type of commission for the transacted booking. This is what we call an “advertising subsidy.” The advertising subsidy will be counted against the value of the voucher (100 Euros in our example). The subsidy can reduce, break even with, or even exceed the applied value (100 Euros) depending on the amount of the booking invoice. In the last scenario, the issuer would have made a profit with the voucher, which is in fact not uncommon. Sound interesting to you? It is! We’re happy to answer all of your questions in a private conversation and discuss the options and conditions with you. The travel partner program for clubs. A modern club has a lot of expenses! A modern club has a lot of expenses. Youth development costs a lot of money, new equipment has to be purchased, the clubhouse needs renovation, the anniversary party is coming up, and new jerseys are overdue. This can hardly be accomplished with member dues and donations alone. Proceeds from “coffee and cake” drives and flea markets don’t really patch the holes in the budget either. But what are the internet and travianet there for? Send your members and fans on vacation! We offer clubs a smart option to generate additional income with traveling. With our travel partner program for clubs, you can earn appreciable additional revenue with low expenditure – even in small clubs. travianet provides your club with a complete online travel shop – in your club colors and with your club logo – at no cost. In addition, you’ll receive comprehensive service and support from us with travel bookings – 365 days a year. Also at no cost! The families and relatives of your club members and fans book their vacations directly through the club’s own travel portal from now on. Here, anyone interested in a vacation can find all attractive travel offers from leading tour operators and even specialized niche vendors. So you get the same attractive conditions for your vacation trip as with other portals, too. Your club’s members and fans will support the club financially with every booking without having to dig into their own pockets. Because for every trip booked through the club portal, the club receives a commission in the amount of 5.0% of the trip price. This will be paid out directly to the club’s account. No minimum turnover is required. Joining and participating in the partnership program is guaranteed free and non-binding for you, and of course your members too, at every step of the way. Even the online travel shop, the phone travel service, and the use of all advertising materials provided by us are free and non-binding. There are no hidden costs or fees at travianet. Tell your club members about this opportunity and encourage them to book as many of their vacations as possible through the club travel portal. If you do this by word of mouth, e-mail newsletter, or your club magazine, the time expenditure will be negligible. Naturally, we’ll also muster your online travel portal in your club colors and with your logo. You can include the link to the travel portal either on the club homepage, or under a sub-domain that we’ll provide. You’ll get a modern, high-quality online travel portal where all kinds of travel can be booked, whether it’s last-minute, package tour, family, hotels, flights, cruises, rental cars, etc. We’ll also provide you with your own service phone number at a fixed line rate. Your members and customers can use this to reach our professional booking service, which is also provides support for all questions about booking and processing the trip. Still have questions, or want to get started NOW? Then give us a call. Our team is already at the starting block for you. For successfully implementing your travel voucher campaign. Our IT team is happy to advise and support you in bringing your voucher campaign to life on your website, on a landing page, or in a customer newsletter. Just get in touch with us whenever you need. We’d be glad to explain in detail the options for technical implementation and the fair terms of our services. What is a travel partner program? A partner program is a successful distribution channel for the sale of travel services over the Internet. Partner programs have proved their worth quite well in the travel sector, as they ensure attractive income for the partner from the first booking on the basis of a performance-related fee (payment per booking). travianet has contracts with over 300 tourism service operators, such as tour operators, airlines, shipping companies, hotels, vacation homes, car rental partners and travel insurance companies. The customer comments about the advertising media offered by travianet on the partner’s page. Using the code associated with the partner's ID, we can assign the booking to a single partner and pay him the advertising cost subsidy of up to 8%, which is transferred automatically when the booking is processed. Everything else is done by travianet. The partner does not have to worry about anything. The most important role for the partner is to provide the appropriate number of visitors from his side. Therefore, he must advertise from his side. There are no limits to creativity in this regard. This starts with the booking of your own vacation and that of the relatives or acquaintances. For example, a small sponsoring in the club newsletter, where you can present your domain on the first page, is also conceivable. Or advertise on the bulletin board in the company or the university. Some of the partners, for example, distribute business cards to their acquaintances even when they are on a personal trip. Or place them in the local gym. In return, they also put a link for the gym club on the side. All you need is some basic knowledge to create your own website. You can find all advertising materials, such as travel search filters, online booking portals, banners, templates or even fully packaged travel shopping locations, in your partner account under "My links" section. All links are automatically embedded with your partner ID. This means all incoming bookings are automatically assigned to your partner account and your advertising expense allowance is then paid out to you. If you choose to advertise a fully packaged travel shop, you only need to forward your website link. travianet's support team will provide help on installation of our advertising material. We always have an open ear for your questions, suggestions and wishes - you can call us on Tel. 0991/29 67 - 60400 or send us an email via support@travianet.de. How do you proceed after signing up? After signing up for free, you can start immediately without having to commit yourself. From the link listed under "My Links" section in your partner account, choose the means of advertising you will use on your home page. The links are automatically generated with your partner ID. This allows for all bookings associated with your partner ID to be credited to your partner account. These links are easy to embed on your website - moving forward, bookings can be made through your website and you will receive a promotion fee of up to 8% for each booking! Now that you are a travianet partner, all you need to do is advertise your website to drive traffic to it as much as possible. This can be done in several ways such as word of mouth to friends and acquaintances, handing out fliers or advertising to invite visitors to the site. You can professionally optimize your website for search engines and search engine marketing by using specific terms that will relate with placed ads on your website. What is the time needed and how do travianet partners work? You can now decide what to do. The amount of time you put on this work is solely dependent on your personal goals. If you set up a domain and link it to a fully packaged travianet shop, you have no maintenance cost whatsoever. Since the shop will be located on our servers and you are simply linked to it, we will take care of the maintenance bit. We revise and update both the offers and links on a regular basis. You don't have to worry about anything except how to drive more traffic to your website. There is often enough word of mouth advertising, a few handouts or flyers being handed out, business cards being shared or a note in the newspaper. As already mentioned, your creativity is on demand – you now have your own online travel agency! If you want to go a step further and design your own website, you need to have basic knowledge some of the most common programming languages. You can then embed our advertising materials, for example the booking portal, into your site’s iframe. In the same way, you can also create quotations and advertise specific hotels or destinations. You also have the option to go a step further and place your own content, such as pictures and content on destinations, on your page. 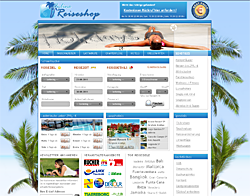 You are not far away from a professional travel site and can still manage your site “easily”. The only hard part is when you have to create content for your website and select pictures to go with the content. Maintaining links and rates is, however, not very expensive. If you enjoy designing your own website or writing about travelling, you can devote yourself entirely to the optimization and maintenance of your pages (usually can be done quickly). You can be introduced to search engine optimization (SEO) and search engine marketing for your website. This can easily become a full-time job where you earn your living. Many travianet partners began with a simple website page and are now managing several large travelling online portals. Decide where the next trip will be. Which concept is right and how can I make my own website successful? Recent findings have shown that it is becoming increasingly difficult to attract a significant number of visitors to websites. What used to be quite easy, today, it has become much more complicated due to the change in algorithms used by search engines. The increasing competition of large agencies owning travel portals, others advertising billboards and TV prime time with large marketing budgets place a new demand on individual website users. Search engines want to provide their users with high-quality search results. Current and unique content are regarded as high quality, such as your own texts with information about a particular destination or a specific form of travel. A single website cannot recommend its content on all tourist destinations worldwide but specializing in particular destinations (such as Fuerteventura) or travel forms (like the Nile cruise or golf trips) has proved particularly promising. It is important for the content to be unique (so-called original content) and should not be copied from other pages (so-called duplicated content). Definitely, one can get the fresh information from other Internet sites such as Wikipedia. travianet also offers a huge selection of content in its travel magazine for various destinations. It is important that your content is always thoroughly rewritten since it can also be found in other websites. If you do not have the expertise to write, you can have an acquaintance do it for you. Ideally, choose a destination that you know well and write a lot about it. Current information regarding events (like carnival in Gran Canaria) or changes in local infrastructure (such as a new beach in Agadir) can also be easily found by searching online. This information is attractive for those who love these special destinations and would like to thank you for arranging for their regular visits or even book for them again. High quality pictures are also important. You can either go back to your own photos or search in image databases on the Internet (copyrights) which you can download for free or for a fee then publish the photos on your own site. In order to integrate your content on the website and make it rank highly on search engines, there is need for optimization. travianet offers you a detailed and easy-to-use guide featuring search engine demo tutorials (check under "Infostore" -> "Documents" -> "SEO-Elearning pro" in your partner account). If you have any questions, please do not hesitate to contact travianet. travianet has many partners who use this concept to generate a lot of bookings and to project high advertising costs. You can also build a nice and content-rich website with simple basic knowledge and using an HTML editor. You do not have to be a professional programmer to do this. Eventually, you can a lot more for new visitors and bookings. Finally, you no longer have to hide offers given by travianet! travianet's advertisements can now be booked anytime, 24 hours a day. You can choose from over 300 tour service providers, several a 100 million travel offers and even compare prices. This is more than most what other typical travel agencies offer in their program. In case of any questions, travianet’s friendly customer service center will advice accordingly. Here, our well-trained travel experts advise our customers and process their bookings. So, why not advertise your online travel agency to your family, friends and acquaintances using your travel website? Of course, you can also book your own holiday through your travel website and be you’re your promotion fee immediately after completing your booking. And why not talk to other tourists in their vacation and having a good time at the hotel swimming pool about the advantages of booking you’re your website then later handing them your business card. The login does not work, what am I doing wrong? First, you should check your username and password. You will find your username in the registration email that you received when you registered. It is important that you write the username and password exactly as they were when you signed up. It is case sensitive ("user" is not "User"). If you have forgotten your password, you can use the "Forgot password" function on the home page of travianet.de to send a new password to the email address you used during registration. If you have forgotten your username or changed your email address after registering, please contact travianet's support team. If your entry is correct and you still cannot log in, you should confirm that you clicked the activation link in the registration email: Access your mailbox, open the registration email and click on the activation link. If you are automatically logged out after successful registration, the problem could be in the security settings of your browser. You should also make sure you’ve logged out at the end of your registration. To do this, go to the Home page and then log off. If you still have problems logging in, please contact the support team. Can I sell travelling packages online without my own travel agency? Yes, you can! With travianet, any website owner can register and embed the advertising media on his website. You don’t have to own a travel agency. You only need a website which you install our advertising media (banners, a booking sheet, the booking system, a template or a fully packaged travel shop) and you can start immediately. travianet takes care of the entire booking process for you! Can I cancel my participation in the affiliate program? Yes. This is because the contract can be terminated by both parties at any time, within a period of 4-weeks, without giving any reasons. In this case, the partner is obligated to immediately delete all advertising material of the Contracting Party (logos, banners, graphics, texts, links, etc.). The website owner is not entitled to retaining or setting off any of these materials. The Contracting Party is obliged to credit and pay off the accrued remuneration of sales, and in the event the Contracting Party terminates the contract, balances arising from already paid recurring costs should also be settled unless the Contracting Party is entitled to compensation of damage costs from the partner. When a partner changes his website domain, that does not change his contract and affect his rights and obligations under this Agreement. Does it cost anything to participate in the travianet affiliate program? Participation is completely free of charge for partner levels "Friends & More" and "Professional L". In the case of partner level Professional XL (earning an annual turnover of EUR 65,000), we charge EUR 50, and for those in partner level XXL (earning an annual turnover of EUR 250,000), we charge EUR 100 per month. Is travianet's service center always open for that long? We would like to offer our customers a service that they do not get from "normal" travel agencies. You can make your booking after office hours or even late at night, on weekends and during public holidays. You can also get information regarding your existing booking. Most Internet users book their holiday at home in their free time, often after 8pm or even 10pm at night. If a question arises or if the customers prefer to call our service center, we are there for them. Do I have to be liable as a partner for errors in bookings or travel services? Of course not. The travel booking is normally completed by the customer and the respective tour operator, the airline, the hotel etc. That is why these companies are a liability if something does not work out as promised. If something goes wrong with the booking acceptance and payment, travianet is the right party to contact for both the customer and the mediating online travel agency. How does making a booking through my website work? From there, travianet takes care of everything else. We make the booking with the tour agency, call the customer back and discuss the mode of payment etc. The customer will later receive a confirmation from us with your website being mentioned as our advertising partner. The customer is also informed that he can contact travianet directly regarding all other questions and requests. For the record, the customer will still be listed under your account even if he calls us directly for the next booking. From our end, your Partner ID is listed with the customer number. How does travianet ensure that transactions are assigned to my partner account? All links originating from your site have your Partner ID or Account ID. This ID will be reflected on travianet when a booking is made. This makes it possible to always assign transactions uniquely. Some providers feature their Partner ID in a chat session, such that the Partner ID is no longer visible in subsequent pages. The crediting process still works without any problems since travianet thoroughly checks all links before they are used in redirecting link. This way, we make sure that you do not lose your booking. Do I have to provide mandatory information on my homepage? travianet’s terms and conditions, the data protection declaration and the EU’s "blacklist" regarding insecure airlines must be embedded on its website. You can find all these information under "Settings" in the redirecting code list in your partner account. You only need to embed the links on your website. We take care of the rest by updating it for you! First, the full company name, including the legal form, must be specified. Furthermore, the street, house number, postal code and physical location must be specified. It is not enough to specify the mailbox. In the case of a law firm or an association, the head office must be indicated. These include the phone number, fax number and contact e-mail address. If you want to prevent spam robots from reading the e-mail address, you should provide the information in the form of a JPEG or GIF file. If, for example, you do not have a fax number, you do not need to specify it. In the case of legal firms, partnerships and other associations, indicating an authorized representative is compulsory. If you are registered in the commercial, association, partnership or cooperative register, the corresponding register must be named and the registration number must be indicated. if available, the tax identification number must also be specified. If there is more information required and it exists, it must be also be indicated. If, for example, editorial contributions are published, the persons accounted for must be named as per Section 10 (3) of the MDStV. This must be a native who is working and has a permanent residence in Germany. Can I use other affiliated programs? It is up to you to decide where to place which advertising media on your website. Can I add multiple URLs to a user account? In principle, you can use travianet’s travel offers on several pages. Do I have to register a business? For the professional partner level account, you can assign your user account number to your own sub account domains, which you can then analyze statistically and through earnings. How can I change my partner level? As a Friends & More partner, you can always become a professional partner to access additional features. Upgrading to the partner level XL and XXL is done by travianet upon request. Your current turnover in the current fiscal year is taken into consideration. If you have reached the required sales targets, or if it is foreseeable that you will reach the required sales targets in the current year, you will benefit from the additional features that come with an XL or XXL partner account starting next month. As a guideline, we use a sales target of EUR 65.000 for partner level XL and EUR 250.000 for XXL partner level. If you would like to change to a lower partner level, please contact our support team by sending us an email at support@travianet.de. We will then change your user account accordingly. When is the payment of advertising expenses done? Unlike other partner programs, travianet pays immediately after the booking has been completed and not a number of weeks after the client has received the service. Since many trips are booked many months in advance, you will easily gain profit especially because you do not have to wait until the service is delivered for you to get your money. Each booking is credited 7 days after being received. Payouts are made twice a month. You receive payment if you have accumulated more than EUR 25. What if the customer canceled his trip? If the customer has to cancel his/her travelling plans, paid advertising allowances will be charged back on the partner account. Must your income be taxed? As an independent entrepreneur or trader, you must tax your income. Employees, freelancers, students, etc., must comply with applicable tax laws and procedures where necessary. Despite freedom of trade in Germany, any admission of self-employment is subject to notification (Section 14 of GewO) irrespective of whether this activity is carried out as full-time or part-time employment. You can get a business license for a small at a one-time fee (about EUR 25-40) at the municipal administration. What is the difference between Partner ID and Account ID? Each partner is assigned a partner ID, e.g. A-11111. One can hold multiple accounts under one partner ID. A good example is in the case of a partner with several websites and wants to separate earnings from each website. The account ID is attached to the partner ID with the suffix -0, -1, -2, and so on. Examples of account IDs include A-11111-0 and A-11111-1 etc. In your partner account, you will find all earnings associated with your partner ID. You can also select individual accounts to track exactly where each earning was made.